This week’s Ask the Craftsman question comes from Lorrel. 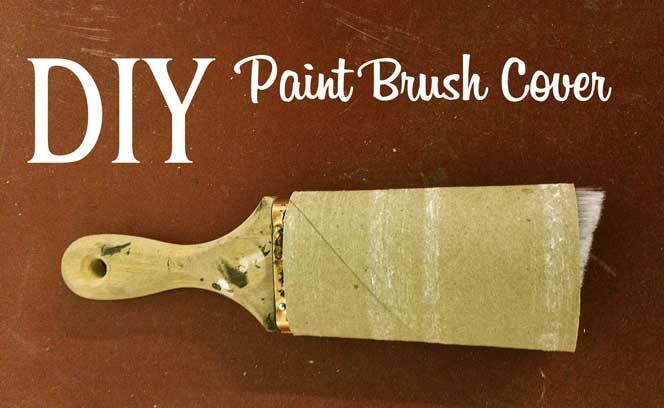 The paint brush cover, or husk, is an important piece of any paint brush. It helps the brush maintain its shape when it dries and protects it when you need to transport it to and fro. Unfortunately, these get lost or wear out quickly and soon you’re left with a good brush that has no protection. Your brush won’t be effective long after its cover is gone unless you find a suitable replacement. There are consumer products meant to replace your paint brush cover like The Paint Brush Cover which work just fine but sometimes you don’t need to go out and buy yet one more thing. When the husks run out in my shop, we use old toilet paper rolls. Just flatten out the roll and you have a perfect fit for a 2″ brush which is the most versatile brush in my opinion. It may sounds too cheap and corny, but sometimes there is no need for an expensive solution when a free one will do just fine. Less waste, no extra money and a longer life for your brush! The Paint Saint looks like a very cool product. I would suggest marketing to marine stores. Touching up varnish is a headache and anytime there is a nick or some wear, it must be dealt with immediately. If not, all needs to come off and be redone. Perhaps West Marine in the States and Whitworth’s in Australia. Looks like a very handy product! I found this post interesting do to my background with addressing the problem of brushes drying out for touch ups. I invented a product that specifically addresses this problem. My product is just for touch up painting(latex). No one really knows about it because I learned how to manufacture and produce the product after years of prototypes but when it comes to marketing I’m totally in the dark. Anyway if your just wanting to do touch ups I think it is an excellent product because it uses the21st century way to seal liquid in a container(silicone gasket) I’m hopeful it makes others lives easier. If you google My Paint Saint….It comes up.